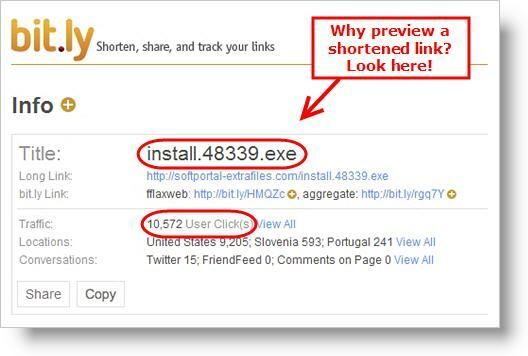 Link-shortening services are more widely used every day, and very useful to turn a very long website address into a tiny URL that’s a better fit for social media, email, and mobile use — but it’s important to be aware that shortened links can also hide a security risk, and stay safe by knowing how to preview a shortened link's destination before you click through to a bad web page! Because a shortened URL cloaks or hides the link’s destination, it can be used to fool you into visiting a web page that’s “not safe for work,” or an affiliate sales page. That’s an annoyance, sure, but a cloaked link could do much worse — take you to a virus-infected site or straight to an executable file that tries to install some sort of malware on your computer. Before you click on a shortened link, consider the source. If you know the person who has sent you the link, that’s a good start to staying safe. But a known source is not an absolute guarantee of safety. Links spread like gossip, and the origins may be lost in a maze of online sharing long before the link reaches you. The fact is, some people do forward links to their friends or share links on social networks without ever having checked out the site for themselves, for a variety of reasons and often with the best of intentions. LongURL also has a web-based tool to expand any shortened link — enter the shortened URL and click to find out where the link will lead. Other web-based link-previewng tools like this are available at PrevURL, ExpandMyURL, URL Snoop, Securi.net, PreviewLink. e.g. change http://budurl.com/wd34 to http://budurl.com/wd34? Many of the major shortening services recognize the growing security concerns around cloaked links and offer previews for shortened links, and are integrating a preview feature. (Sadly, my own current favourite web-based Twitter manager, HootSuite, has not yet introduced a preview feature for ow.ly, its own link-shortening service.) Every time Hotmail users are infected en masse by malicious spam, or Twitter and Facebook are hit by a phishing scam, the perils of shortened URLs become clear to more and more web users — but the sheer convenience factor almost guarantees that the use of shortened links will keep on growing. Best learn to stay safe, and know where you’re clicking to! What tools do you use to preview shortened URLs? Steven, goaturl.com doesn't seem to have a preview option...? Rebecca, that is such great advice. Most of the time I avoid clicking anything that looks shortened! What a wealth of free info you have there!